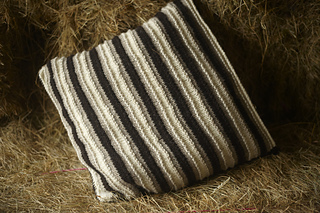 This stylish cushion is knitted primarily in stocking stitch. Interest is added through the use of purl row ridges and bold use of colourwork. 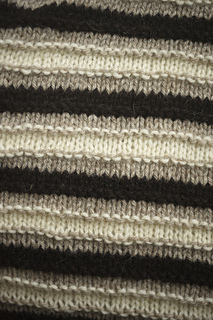 The cushion’s stripes use three natural colours of Blacker Yarns, British breeds aran - Galway, Black Welsh Mountain and Shetland. We think this cushion is a wonderful showcase for the yarn. The different textures of the flbres make this a gloriously tactile item. finished cushion measures 40 cm / 16” square. Always remember to use needles which result in the correct gauge after blocking.